So, there! 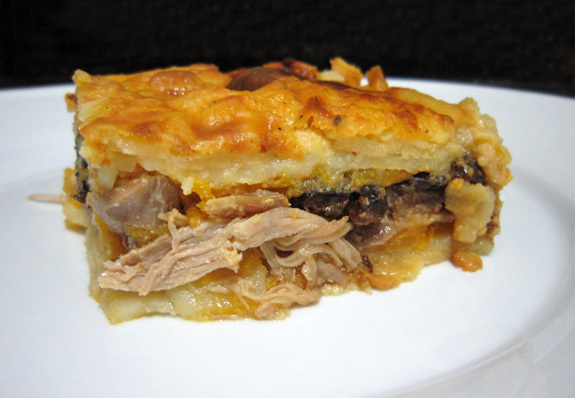 My Moldovan turkey gratin is full of what appears to be quintessential Moldovan ingredients, and it’s layered and baked like a Moldovan moussaka. Moreover, for my American readers, it’s an instant Thanksgiving classic that doesn’t even require you to be able to spell / pronounce / locate Chișinău on a map — and if you can’t wait till next year, you can always prepare it for Christmas. This makes a sophisticated side for roasted turkey breast, or a whole bird minus one leg. Or you can easily adapt the recipe to use your leftovers. Weigh the turkey thigh and leg, then measure 2.5% of that weight in salt. Sprinkle the salt on the meat, and transfer into a sous-vide pouch with the duck fat, garlic, peppercorns, clove, and thyme. Cook in a 166 F water bath for 25 to 30 hours, until very tender. Reserve. You can prepare in advance and refrigerate it for a few days. Using a mandoline, slice the butternut squash into 1/8″ thick slices. Do the same with the potatoes. Place the milk into a large pot with 3 oz of the butternut squash. Add the salt, black pepper, and nutmeg, and cook over medium heat for about 10 minutes until the squash is tender. Blend until smooth, using either a hand blender or a regular one. Add the potatoes, and simmer over low heat for 20 minutes, stirring regularly. Place the turkey confit with its fat and juices in a saucepan over very low heat. Add the prunes, cover and simmer for about 20 minutes. Let cool for a few minutes. Drain the turkey meat, and shred into small pieces using your fingers (I got about 9 oz meat). Mix with 4 tbsp of the cooking liquid and reserve. Drain and reserve the prunes, as well. In a 8″ x 11″ dish, pour half of the potato mixture and spread evenly. Cover with half of the butternut squash, then arrange the meat and the prunes on top. 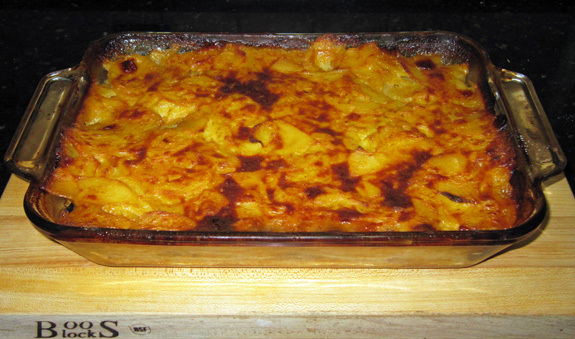 Finish with another layer of butternut squash, followed by the rest of the potatoes. Bake in a 350 F oven for 1 1/2 hours.